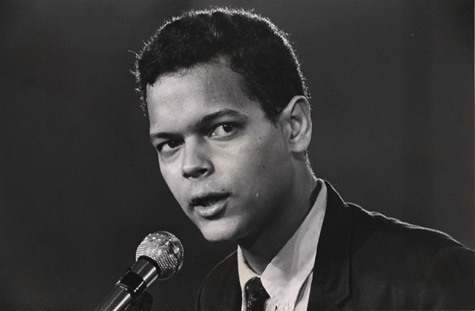 Here at Cultural Organizing we would like to remember another piece of Julian Bond’s legacy — his poetry. Bond was an English major at Moorehouse, where he co-founded the literary magazine the Pegasus. Along with his many essays on race and politics, Bond’s early poetry has appeared in a number of anthologies and publications. These poems speak to Bond’s love of Black culture, his understanding of racial oppression, his commitment to the long, difficult work of social change, and his beauty as a person. Below are four of his most well-known poems. Rest in Power, Julian Bond. This poem was written as a response to Walt Whitman’s, I Hear America Singing, and resonates with the language and spirit of Langston Hughes’, I Too (also likely a response to Whitman). The poem was published in the first issue of SNCC’s newsletter, The Student Voice, in 1960. In the video below, Bond reads his most famous poem, a couplet he wrote in college. We can’t all be Martin Luther King. Don’t it make you feel alright???????? According to Bond, this poem was based on conversations he had during his first trip to Cuba as a nineteen-year-old college student at Morehouse, soon after the Cuban Revolution.